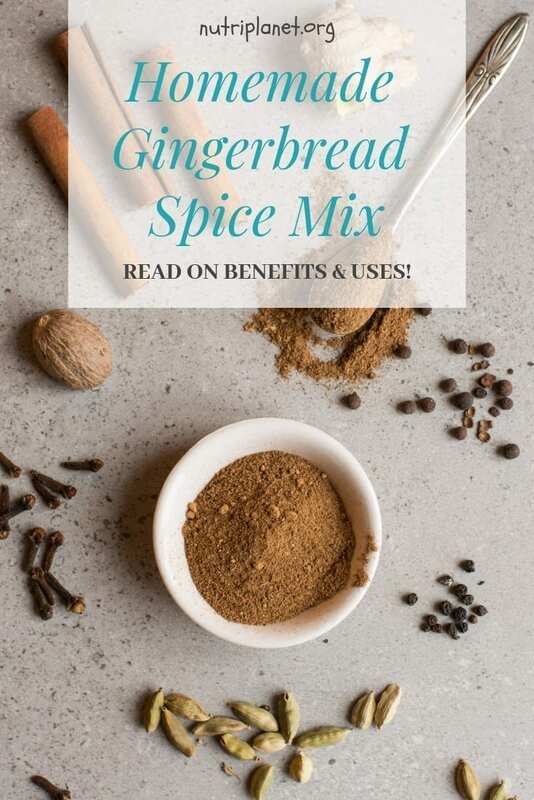 You definitely need this homemade gingerbread spice mix recipe for the holiday season, if you’re like myself and love gingerbread flavour. It’s just so easy to have the spices already mixed together for recipes that call for gingerbread spice. Furthermore, it’s so much better than any store bought variation. Now, I’ve seen many different spice mixes online, but this is the one I stick to as, in my opinion, it has the best gingerbread flavour. In all the recipes that call for gingerbread spice of course – baked goods like gingerbread cake, crispy gingerbread cookies, soft gingerbread cookies etc. 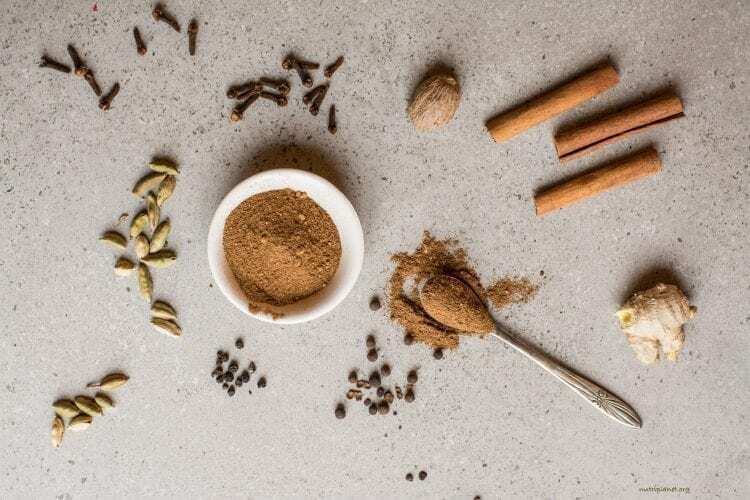 Gingerbread spice mix would also work great as substitution for pumpkin spice in pumpkin pies, lattes and all the other recipes that call for pumpkin spice. You can even go as far as adding some gingerbread spice mix into your hot chocolate and make gingerbread spice latte or tea. It would also work really well in porridges and chia pudding, or even pancakes and waffles. Gingerbread spice is a true superfood mix that promotes your health in many ways as long as you don’t ruin the benefits by making conventional baked goods high in refined sugar and saturated fat. So, stick to healthy whole food plant based recipes! For example, Gluten-Free Gingerbread Cookies (Candida diet friendly), Whole Food Plant-Based Gingerbread (they include dates), Soft Pumpkin Gingerbread Cookies. Cinnamon loaded with antioxidants, promotes stable blood sugar, high in calcium, has anti-inflammatory, anti-bacterial and anti-fungal properties. Ginger is effective against nausea, anti-inflammatory, anti-bacterial and anti-fungal, lowers blood sugar, aids digestion, may reduce menstrual pain, lowers cholesterol. Clove is high in antioxidants, fibre, manganese, vitamin K and C; anti-fungal and anti-bacterial, can kill off parasites, supports liver health, helps regulate blood sugar levels, may promote bone health. Cardamom may lower blood pressure, anti-inflammatory and anti-bacterial, helps with digestive ailments, may treat bad breath and prevent cavities, regulates blood sugar levels. Relieves pain, promotes digestion, good for brain health, detoxifier, anti-bacterial and anti-inflammatory, natural remedy for insomnia, boosts digestive and bone health, regulates blood pressure. Anti-inflammatory effects, boosts immunity and dental health, rich in antioxidants, aids digestion, helps to improve blood circulation, protects heart health. 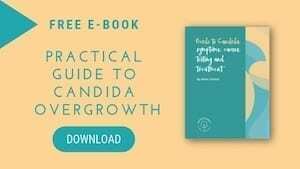 Caution – can exacerbate existing gastric ulcers or ulcerative colitis. It’s rich in potassium, calcium, magnesium, phosphorus, and B vitamins; aids digestion and enhances bioavailability (especially of curcumin), relieves sinusitis, asthma and nasal congestion, helps fight infections, anti-inflammatory and anti-bacterial, aids in weight loss and cures vitiligo, reduces risk of cardiovascular and liver ailments. 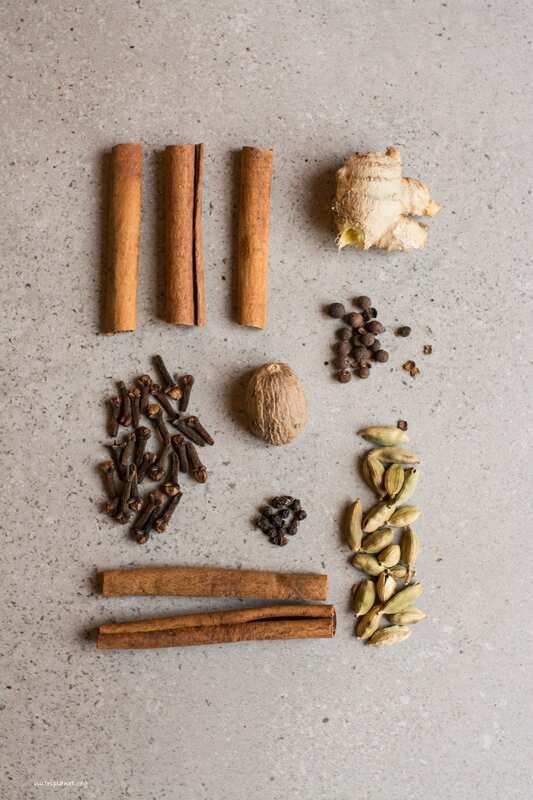 Whenever you can, opt for organic spices as for starters they have much stronger flavour. In addition, conventional crops are being treated with various insecticides, fungicides and herbicides. Furthermore, to eliminate bacteria, mould, insects, and other contaminants, manufacturers irradiate the seasonings with up to a million rads of ionizing radiation (the equivalent of one billion x-rays!) in order to sterilize and pasteurize them. This practice is known for potentially creating dangerous carcinogenic by-products. To sum it up, non-organic seasonings can contain many additives, such as artificial preservatives, food dyes, anti-caking agents (such as the man-made sodium aluminosilicate), filler ingredients, and flavour enhancers, such as sugar or MSG. 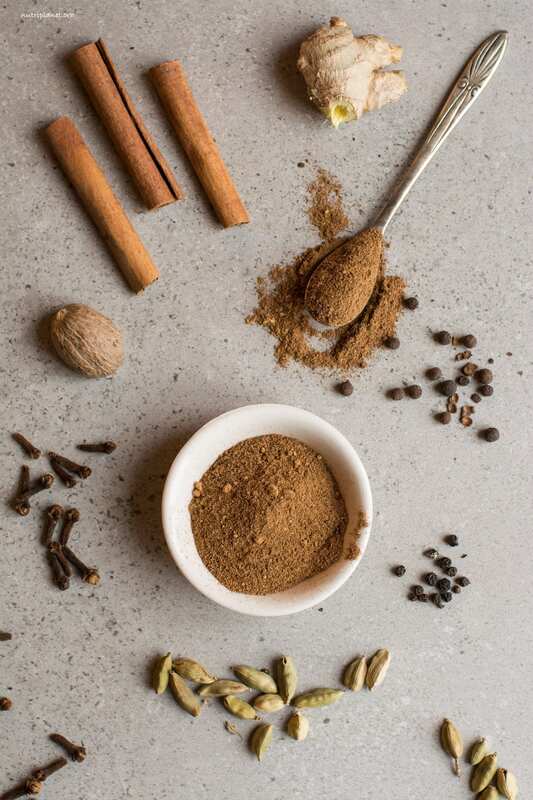 Have you ever made your own gingerbread spice mix or do you prefer to measure your spices every time you bake? Do you use different proportions of spices or include/exclude any ingredients? Let me know in comments! I’d love to know! First, remember that all the gingerbread spice ingredients need to be dried and ground. Mix them all together and store in a jar or sealable container. Nutritional info per teaspoon of gingerbread spice mix: 14.1g potassium, 11.2g calcium, 2.5g magnesium, and 2.4g phosphorus. Should you prefer your gingerbread spice mix less spicy, try using less ginger – one tablespoon instead of two. Use ratio 2:1 when it comes to cinnamon and ginger (for less spicy variation), if you make a different quantity. I just fell-upon this recipe (was searching your blog for grain-free recipes) and it’s exactly what I was looking for – your mix is fantastic. I made apple butter one year where I used whole spices that I then ground to powder and it made a world of difference – whole spices are definitely richer in flavour. I’ll be adding this to everything! I am using your porridge mix but it does not give the gingerbread flavour I want so this is the answer. Very interesting you call it pepper bread. In Québec it is simply called Pain d’épice (spice bread). I’m going to make the obvious cookies, loaf etc but also for porridge, to season granola, for yogourt parfaits…yum. Thank you Lynn! I’m so glad that you find this mix awesome 🙂 Enjoy the flavours!